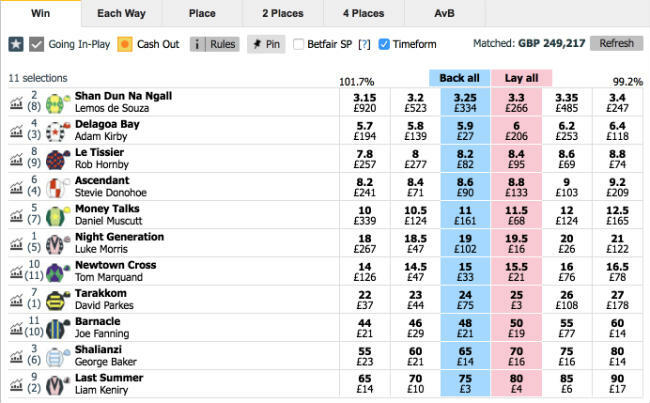 ‘Betfair trading’ is a phrase that puts many people off before even getting to see its potential. Before they introduced a sportsbook, Betfair and its exchange was seen as the choice of the ‘thinking man’. This was exactly the reason that they decided to introduce their sportsbook – a site that takes bets just like a regular bookmaker – to capture the more recreational customer. The customer that isn’t wishing to be the thinking man. Betfair were already beating the traditional bookmaker with their exchange; next it was time to play them at their own game. Betfair Exchange offers higher prices than any bookmaker (99%+ of the time) and this is because you’re betting against real people – with Betfair themselves simply taking a small commission to earn their keep. No bookmaker margins, here. However, with the way their odds system operates, the opportunity to came about to trade the odds as they increased or decreased in price. Anybody can learn how to trade on Betfair, and it is not as complex as it first looks. …But we do understand that it definitely appears to be complicated. 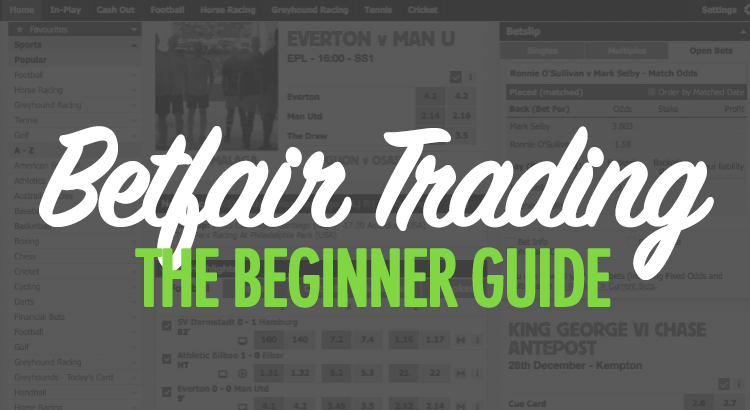 If you’re willing to put the time and effort in to learn this skill, our beginner’s guide to Betfair trading (that’s this very post, the one you’re reading right now!) will help to dispel the notion that sports trading is difficult. From then on it is up to you to get the hands on experience in order to understand the movement of the odds and maximise your profit on your trading journey. So, if you fancy yourself as the next Peter Webb or Caan Berry, read on! In June 2000, two entrepreneurs, Andrew Black and Edward Wray, launched a website called Betfair. It was to mimic the stock market, but with one small difference; the commodities for sale weren’t copper, coffee or coal. They were betting odds – the same betting odds that had, so far up until then, been sold at low-value prices via traditional bookmakers. This invention, it would come to be acknowledged, was revolutionary. Suddenly, the average betting customer became both the punter and the bookmaker. This meant that odds could be bought and sold – or backed and laid – and the prices, just like on the world’s stock markets, were in constant flux. It also meant that the dreaded bookmaker overround (the way that bookies make their profits) was a thing of the past. The price that the odds are sold at on Betfair should, theoretically, reflect their true market value – and should, theoretically, offer a better deal for those betting or trading in them. Professional traders quickly started to earn huge incomes via the platform. But how do you trade on Betfair? Let’s make it clearer by walking through a real-world example of a Betfair trade. Just like at a traditional bookmaker, we can use Betfair to place a bet on the outcome of, let’s say, a football match. But the difference now is that we can both back the bet, and lay the bet; which means to bet AGAINST an outcome. So, as an example, we could either back or lay the outcome of a draw for a given football match, depending on whether we think the game will or won’t be drawn. …But this is where things just start to become interesting. As we mentioned earlier, the odds are offered are in flux; they change, both before the game has begun, and during. The price is volatile, not static. Bookmakers, in comparison, are much slower to update their prices. Because we can both back and lay an event, if the price at which we backed the draw lowers, we can then lay the draw and lock in a profit for ourselves regardless of the actual outcome of the match. Imagine if we backed the draw at odds of 3.0, with a stake of £10. This would give us a profit of £20 if the game ended a draw, or a loss of £10 if it did not. Now, if the game was level at half time and if the odds were to change, say to around 2.0, we could lay the draw, this time with a stake of £15. This would give us a profit of £15 if the game ended a draw, or a loss (known as ‘liability’) of the same amount if it did not. As you can see, regardless of whether the match finishes in a draw after this, we would come away with a profit of £5. This is essentially the maxim of “buy low, sell high”, but the betting exchange version as opposed to the stock exchange. We can use features within Betfair trading software (discussed in detail later on), Betfair’s own cash-out feature, or an arb calculator provided by Chromaweb if you wish to do things manually. We wholeheartedly recommend you choose the software option. The implications of being able to back and lay on the same event – which bookmakers are not fond of, to say the least – have profound effects. Now you have the basics of how it works, we’ll introduce a few different trading terms that may be used in this guide so that you understand their meaning. To trade for profit across every selection. Known as a ‘Green book’. To trade for a loss across every selection, known as a ‘Red book’. To cancel a trade by placing a bet opposite to your original one at the same odds, or to cancel any bets that remain ‘unmatched’. This is the difference between available price increments. The value of a tick depends on the size of the odds. At prices lower than 2.00 the value of a tick is 0.01. Above evens is is 0.02 and it gradually increases to 0.2 per tick as the odds increase. Usually defined as the practice of making a number of back bets on a given market, dutching is a sensible way to spread a given stake over a multitude of selections to hedge against the risk of a single, isolated bet on that market not coming in. But for the trader, dutching can essentially be viewed as the art of bookmaking, inverted. This means that you, as a trader, could potentially back every selection in a market, and still make a profit, assuming that you backed at prices that gave the book an under-round, rather than an over-round. These are stylised odds and stakes, but if you crunch the numbers, you will see that it doesn’t matter which horse wins, you will still come away with a profit. As the name suggests, this strategy has you placing a lay bet on every selection in the market – usually a horse or greyhound race – with the hope that you can catch enough trades at the right prices to ensure that you make a profit, no matter what the outcome of the event. The usual way in which this strategy is implemented is by placing orders across the market at odds below 2.0. This way, if a minimum of two selections are taken up, then a profit is guaranteed. If you are lucky enough to get more than two selections, then the profit rises, quite spectacularly. On the face of it, this approach to trading appears to offer lucrative rewards with a very simple strategy. But be warned; the markets are more robust than we often give them credit, and laying-the-field isn’t a smooth road to success. This is the term used to describe very short term backing and laying of just a few ticks apart in quick succession to tie in small profits. This is a low-risk, low-reward strategy. It is best done in markets where the price is fast moving and trades will usually only last seconds rather than minutes. An example of this would be to back under 0.5 goals as a match is drawing to a close and then lay it for a profit a short while later as the price has decreased. This is the most common method for trading on Betfair and still requires the movement of odds, but at a greater movement of odds, similar to the first example we showed you above. The risk on this is usually a lot greater as you are usually relying on an event of some significance or a draw out decay in the price to occur. Things that can rapidly change odds are things like material events (goals & red cards in football, wickets in cricket or a change of conditions when trading horse racing). Information and weight of punters money can also cause a price to swing. You will have often seen a price decrease close to kick-off in football as punters look to get their money on a particular selection. This is quite complicated because you don’t have the comfort of your actual market position being updated in your market information. An example of this would be trading across over/under markets and correct score markets in football to create a no-lose position. This is something that you’ll probably want to leave until you gain more confidence in your trading ability. Perhaps the biggest thing to consider is that when you trade solely on one market, the commission that you pay is based on your total profit on that market. However, by trading across two different markets, you may win on one, but the commission calculation doesn’t take into account you lost some money on the other market. So you will pay more commission, and is something to factor into your calculations. Commission is small, but over time adds up to a significant amount of money. Betfair offer such a range of markets, especially in football that essentially offer the same possibilities, but just have a different way of stating them. And what you will find is that some markets offer better value than others even though they are essentially the same thing. For example, if you lay Correct Scores 0-0, 1-0, 0-1, 1-1, that is essentially the same as laying under 2.5 goals and may present opportunities. However, whilst this is something to be aware of when you gain a greater understanding of trading, it is important to know that the opportunities to profit here are decreasing. Betfair have developed a cross market matching tool that takes advantage of liquidity in one market and uses it to seed another. This constant sharing of resources between markets acts to make the price more consistent across all markets. This is used across all football events, but just for a selection of markets. It is unclear how Betfair will look to develop this in the future. First things first, if you don’t yet have a Betfair account, sign up here right away. You don’t have to deposit yet, but holding off from creating your account is just one more roadblock that is delaying your potential earnings. When you first get started on your trading journey, the most important thing is to set aside a bank for trading. Importantly, it must be an amount that you are prepared to lose. This may sound negative, but it takes time and patience to learn how to trade and there is a good chance that you will lose a lot of your trades whilst you navigate your way through the markets. It is important that you detach yourself from your initial deposit emotionally as your mindset is vital to long term success. If you already use Betfair for general betting, look to do that activity elsewhere and keep your bankroll solely for trading. It makes tracking both your trades and your progress far easier. Technically, you can trade without software by using just a phone or a tablet, but this is a mistake waiting to happen. Your setup will develop as you get to know the needs of each individual sport, but as you’re beginning, a dual screen monitor PC set up with an additional screen to watch live sport is a good place to start. At the very least, have a mobile phone handy using your mobile internet as back up. There is nothing worse than your computer or internet failing and you having to wait to get back online to check a trade. So a mobile phone where you can scratch a trade in the event of an emergency could be a life saver. In this day and age with a plethora of sports available, it is easy to get over enthusiastic and trade across numerous sports. All this will do is confuse you, so pick a sport that you understand the most as this will speed up your learning process. Once you become a master of one sport then you can look at other sports, but no sooner. Whilst it is important to get experience actually using the markets yourself, use this guide as a base from which to read up a bit more on the basics of what you’ve learned. Youtube videos also are a great way of furthering your knowledge and you can watch videos with various different levels of difficulty if you need a visual example of how to do something. You could quite honestly write an entire book on different trading strategies, so this is where you need to do the hard work. The best thing to do here, is once you have narrowed your individual sport down is to research the most common strategies and play with a few to decide which one you’re most comfortable with. There are hundreds of different videos on YouTube, various books, internet guides and discussion forums on the subject. You are living in a time where you have access to a ridiculous amount of information – information that wasn’t available 10 years ago. So make the most of it! One thing to remember is, the smaller the market(s) you pick to specialise in, the bigger your advantage could be. However, there is less information out there to learn about it. Pre-race scalping – If you watch a market before a horse race you will notice that prices move in small increments allowing you to trade and make small profits quickly if predict the correct movement. Profits will only be small from each trade but they will build up! Back to lay horse races – The key to this is to spot horses that will start fast. You back the horse pre race as near to the off as you can and then lay it once it goes ahead early in the race and the price decreases. Swing trading a horse race – By understanding the markets and how the graphs move you are able to determine price movements and trade large swings in price. Lay the draw – The most common football strategy. This is done by laying the draw and then re-backing it when the favourite scores and the draw price increases. Scalping over/under 2.5 – The key to this is to back under 2.5 goals in a game and then lay when the price decays. Trading team news – Your knowledge of teams has to be spot on and you need to be quick off the mark. But there are lots of opportunities for price movements when a stronger, or weaker starting line up than is expected by the markets is announced. Twitter is your friend here. One of the most common, and most important sayings in trading is ‘Let your winners ride and cut your losers quickly‘. And it is 100% true if you wish to be successful in the long run. Being a successful trader is understanding that you won’t win every trade, but the key is to recognise when a trade isn’t going in your favour and exit fast! If you are a Sportsbook gambler, you will probably be in the mindset of hoping every bet wins and seeing it out to the bitter end. But in trading, you are largely betting on small price movements rather than results. So if a price starts to move negatively, your number one goal is to scratch the trade, protect your bank and move on. Here are a few points to consider when formulating your plan? The overall strategy that you use will be the ultimate factor that determines when you exit your trade. If you are scalping, your exit point will be just a few ticks away from your entry point. In fact, you will probably be best off placing the potentially winning exit trade straight after your entry has been matched. There are a few reasons why this would be beneficial. Firstly, it reduces the risk of you losing your discipline and getting carried away, allowing your trade to continue and increasing your risk. It also means that you get to place your order higher in the queue. Remember when we spoke about Scalping being a game of speed? Well, in case you don’t know, when you place an unmatched bet into the system, they are taken on a first come first served basis. When you place your bet you must wait for all the money ahead of you in the queue to be matched before your bet is taken. But should the price move in a negative direction, have a set about of ticks that you will exit the trade at and stick to it at all costs. You must work out for yourself what the best value is for you to exit at, but over time you will adjust these figures to ensure you are in profit. It all depends on the percentage of winning trades you execute. With swing trading, there is a little bit more leeway. Sometimes the price might bounce negatively before it goes in the correct direction and follows it’s true trend, so you are relying more on your intuition. But you must learn to distinguish the difference between when you are letting a price settle before finding it’s true course, and just blindly hoping it will move in your favour. And if it moves in a negative direction for a pre determined number of ticks, get out. When it is headed in the correct direction, just ensure that that you monitor the graphs and volumes traded so you can spot when the price has settled. One of the best ways of determining your exit point is to look at your previous bets which you should have recorded. Look for similar trades you have completed, and this will give you a better understanding of how the price moves when you are confronted by a similar scenario. When making your post trade notes, it always worth monitoring the price to see where it ends up after your trade and adding a comment on whether you was correct to exit at your chosen point. You will never be right all of the time, but a loss or an imperfect trade is nothing to beat yourself up about. It is a learning opportunity. To help you read the charts and make a decision on where the price is headed, there is software available to buy that analyses the market and calculates the possible upper and lower variations to the price – the support and resistance levels. It’s not a hard and fast rule, but from here, if the price is at the upper limit it will usually decrease, and if it is at the lower limit, it should increase. But of course, it is important to supplement your reading of the graphs with the research you have conducted on the event and the real time information that you have available which can cause a price to be moved outside of these ranges. Can you place bets for insurance to lower the risk? It is important to consider all outcomes when you trade, and a way that you can mitigate the risk is by placing bets on related markets to offset any potential loss if your trade goes against you. For example, you may be using the popular ‘Lay the draw’ trading strategy, which relies on you laying the draw in the match odds market and then trading for profit when a goal is scored in the game. The danger here is that the game could finish 0-0. However, by placing a small amount on the 0-0 price, you can minimise any potential loss should a goal not come. There are many ways which you can cover yourself with insurance bets on other markets, and it’s important to keep your eyes open for other possibilities. It may be a cautious approach, but your bank balance will show the benefits of caution! Are you managing your money correctly? Your exit strategy will tie in with your overall balance and predefined tolerance for risk. You should always use stakes that are even and proportionate to how much is in your overall bank. As a result, one, two, or three loses in a row shouldn’t hurt you at all. You should put yourself in a position where your goal is to protect your bank at all costs. Many people think the key to trading is to try and win money. Yes, that is a goal, but protecting your bank, and first concentrating on not losing is the way that you build long-term profits. Should you find yourself down to the bare bones of your Betfair balance, the temptation would be to gamble recklessly and win it all back quicker. But that is the time for increased discipline so you can slowly build it back up. When you head for the exit, you don’t have to trade out of your position completely. If you are swing trading and sitting in a winning position but you feel that a price will continue to move, you can use the green position you have put yourself in to minimise the potential loss if it moves back against you, while waiting to see how much of a bigger swing you can bag! Your mental attitude and discipline is quite possibly the most important aspect of being a successful trader. You might have all the tools needed to trade successfully: the sports knowledge, a mathematical mind, the equipment, the lightning quick TV feeds etc., but if you haven’t fine-tuned your mind for success in this game you are probably going to fail. Discipline is vital. We have all won bets and are aware of the feelings of euphoria you get when you’ve beaten the bookie. Likewise, that gutting feeling when a team scores in the 90th minute and kills your 10 fold accumulator whilst your imagination was already counting the cash. To trade successfully you must be able to put these feelings to one side and be ice cold and calculated. Scrub that from your mind. Being wrong in the markets is just a discovery of a way not to do things in future – a learning curve. But if you hold onto the belief that being wrong is bad then you won’t exit trades when you should, or you will lose confidence for future trades. Trading is about long term success and it is vital you work on these limiting beliefs. There are numerous other emotional states that will lead to you making poor decisions: Anger, disappointment, unhappiness. Learn to assess your mental state and only trade when you’re in a good place or it will show in your P&L. Your number one aim, before making profits is to protect your bank. This means that you need to devise a sensible trading strategy to grow your profits long term. Regardless of whether you are trading an exchange, or punting on a sportsbook, one of the main failures of recreational gamblers is that they bet huge proportions of their bank. Yes this may mean that you can build big profits on a good run. But you are guaranteed to wipe it all out when results go against you. A good place to start is to bet a maximum of 5% of your bank as your total liability. Ideally it will be smaller – especially whilst you are learning. The worst case scenario here if you fail to scratch a trade, you can live to fight another day. This is to protect against situations where your PC crashes, internet dies or Betfair fails. But ideally, you will have recognised that it wasn’t the correct trade and you will exited as per your pre determined rules. What you need to keep in mind is that the markets are full of novices, with no price awareness and little desire to get true value. They are typically recreational betters that operate at smaller price levels. The easiest time to make money and build your betting bank is when you are operating at these smaller levels, so don’t be in a rush to move into a fight with the big hitters. Take your time. By having level, consistent stakes and using the edge you have gained in the market, you will start to see small incremental increases in your balance and withstand any variance in the markets. After you have completed say 100 trades and you feel you are getting a grip on how the betting markets are working, you may notice that your balance isn’t where you expect it to be. But you may be closer to success than you think, and there is a simple way to find out. Simply document all of your trades in an excel spreadsheet. Include all relevant details, such as entry point, exit point, match/race, selection, as well as any notes that you may feel are relevant. Even down to how you were feeling before, during and after a trade. Then look for trends. Analyse the key aspects behind your winning trades and your losing trades and you should be able to spot where you are going wrong. This adjustment could be a key way of ensuring that you correct small mistakes that turn you into a long term winner. Once you identify the mistakes that you repeatedly make, write them down on a post-it note and keep these viable. Trading can require quite instinctive decision making at times, so having a note in front of you at all times will be a great visual reminder of where you have been going wrong. It is important to keep doing this in the long run also as you may go through periods of bad form and this same method will enable you to get back on track a lot faster. Once you have a basic understanding of the markets and how they operate, it’s a good time to learn how to use one of the the various pieces of trading software. We currently recommend using Geeks Toy for Windows, and BetTrader for Mac. Without it, it is like going into a gun fight with a pen knife. Remember, betting exchanges are peer-to-peer betting platforms. You are going head to head with thousands of other people, and the most savvy of those are using software to execute their bets quickly and smartly. Firstly, trading software that enables you to speed up your trading and give you the opportunity to beat other users to available prices and visualise weight of money in the market to give you a better idea of the direction a price is headed in. Secondly, there are automated trading apps available that let you automate your trading strategy with the software acting on your behalf executing trades based on a given number of conditions that you specify. To begin with you are most likely to use the first option. It is a piece of software that you download and has access to the back-end of the Betfair website. This is vitally important as it means that you aren’t being slowed down by the numerous different factors in the browser interface on Betfair.com. The desktop software layout is slightly different to what you are used to, but it gives you an abundance of different information and available options to be successful with your trading. It is a quite crowded market place however, with new tools being developed all the time. The best software is very subjective and frankly down to personal choice so you may need to play with a few options in order to decide which one is the right fit for you. Areet mate, I came to this link from your email ‘5 advanced ways to maximize profits’, the most interest part of the email was the ‘trading against matched bettors’ section, do you have anymore information on that other than what’s above?